With the sound, are the authors doing something new with the microwire there, or something that just hasn't been done much before now? Love the mosquito and the tunnel. Awesome music by 505 as usual and really great looking effects. Will rewatch this quite often. As MKM said :) Nice work guys for this invitro ! 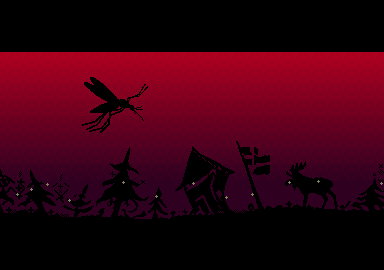 Love these fullscreen effects, especially the one after the mosquito logo – definitely my type! Spacesynth track sounded neat. How this ended up second is way beyond me. Leonard: Well it is not like soundtracker. Rather a bunch of ADPCM encoded sample loops that are played in sequence with additional LMC1992 effects for treble+bass filtering and stereo panning. It's using Kalms/TBL Amiga ADPCM codec that I adapted for STe 12.5/25kHz and PAL-VBL. About 90 scanlines wasted for decoding and another scanline for the LMC1992 stuff. All in all about 29% gone to play the music. But it does save 50% on sample datas compared to native STe 8-bit sound and it was fun coding the rest with some other limits than usual. I like this a lot! Really a great soundtrack! Just awesome, great soundtrack too! Yeah nice soundtrack, big fat effects. Great one. Lovely colour scheme, colourful effects and of course amazing tune (hard to believe this is played on a ST)! But i have to admit that at the last DHS demos i always have the feeling most effects look very similar to previuos DHS productions. Ofcourse superb smooth overscan part, an usual with DHS. page created in 0.017195 seconds with 16 queries.